The star-studded line-upfor the £100,000 race includes defending champion Cue Card and Menorah who prevailed in 2014. Coneygree, the 2015 Cheltenham Gold Cup hero, also holds an entry in case the West Yorkshire track is hit by a deluge. Former Ryanair Chase winner Dynaste represents David Pipe while Blaklion, who won the Towton Novices Chase at Wetherby in February en route to Cheltenham glory, is a confirmed runner from the in-form Nigel Twiston-Davies yard. The field is made up of the Paul Nicholls pair of Virak and Saphir du Rheu, the Phililp Hobbs-trained Sausalito Sunrise who is a stablemate of the aforementioned Menorah, The Last Cavalier from the Welsh yard of Rebecca Curtis and Sue Smith’s Wakanda. 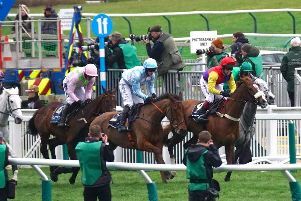 Grand National runner-up The Last Samuri has also been entered by Kim Bailey. With the going currently good, clerk of then course Jonjo Sanderson is planning to water the ground to ensure conditions do not become too quick.